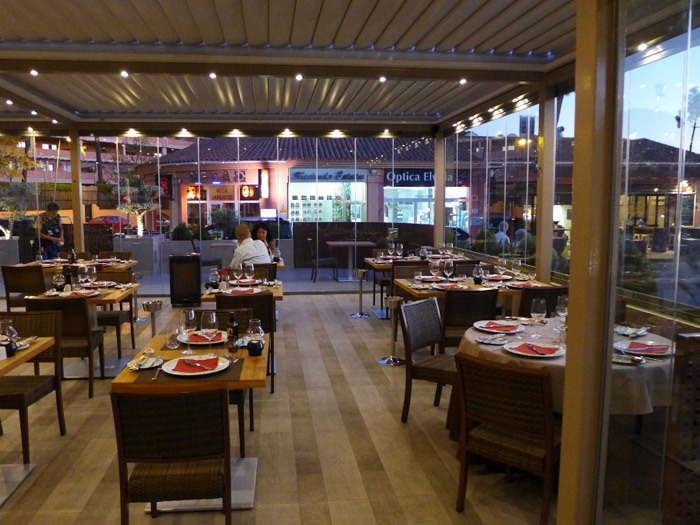 We are also distributors in the rest of Malaga province and across the country. Specially designed to resist the extreme conditions of Finland, glass curtains can be installed in any climate and environment: private homes, commercial, indoor, outdoor spaces, etc. This product stands for pioneering sliding on angles varying degrees. Materials used in the manufacturing process of glass curtains are subjected to various checks to ensure quality and reliability thereof. Profiles, glass, plastic and metal accessories that carry since 1991 demonstrating its efficacy against time and inclement weather. Our glass curtains system is the only system on the market that offers a 10 year warranty. 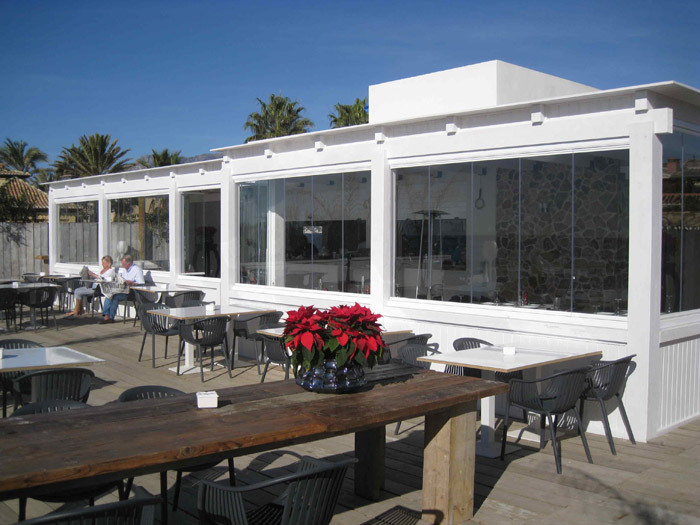 Maintenance of glass curtains in San Pedro Alcantara is very simple, requiring only lubricate the bearings (only) with silicone spray and cleaning of the inside profiles. The glass supports the use of cleaner or water used with a microfiber cloth, does not support the use of abrasives. 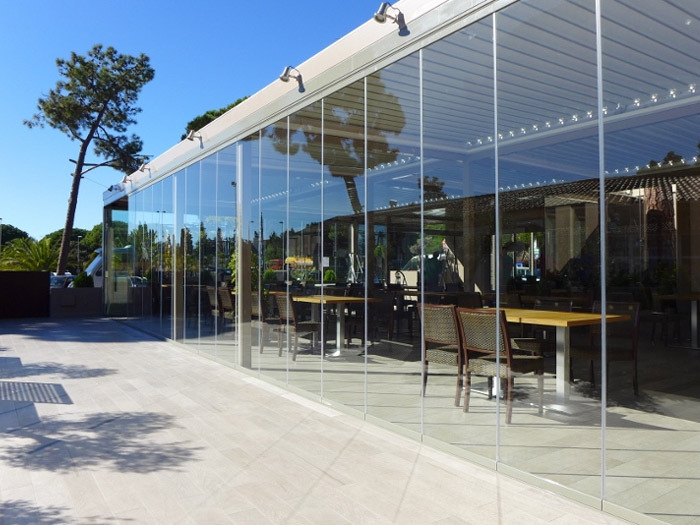 As exclusive distributors of our glass curtains system in Spain, IDEAterrazas® manufactures, sells and installs glass curtains in San Pedro Alcantara since 2002. Since then, we have performed more than 15.000 installations of glass curtains. Our company focuses on providing a comprehensive, specialized and personalized service. In IDEAterrazas® we are aware that each project must be specifically addressed according to the needs of each customer and the characteristics of the place where he will proceed to the installation of glass curtains. We try to respond quickly to all our customers, both when the project budget as when installing glass curtains, just have to wait 3-4 weeks since the visit of our technicians and budget approval to the installation of the frameless glazing system. In IDEAterrazas® have specialized in conducting joint work team because, often, installing glass curtains takes place in conjunction with other work of new or renovation work. The frameless glazing system is backed by our after-sales support and with 10 year warranty. 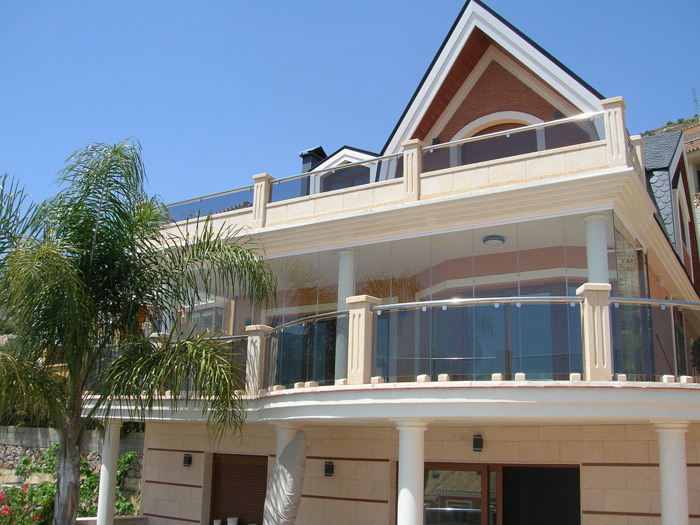 Expect IdeaTerrazas if you are looking for an installation service glass curtain in San Pedro Alcantara. NO ABRASIVE PRODUCT SHOULD BE USED. Keep the interior profile free from dirt and dust. Lubricate the rollers with silicone spray. NO OTHER LUBRICATING PRODUCT SHOULD BE USED. Our glass curtains system is complimented with different types of accessories such as door handles and knobs, locks and fastening systems. Like the rest of the system, the accessories used by IDEAterrazas® are produced using the highest quality materials and go through various tests. 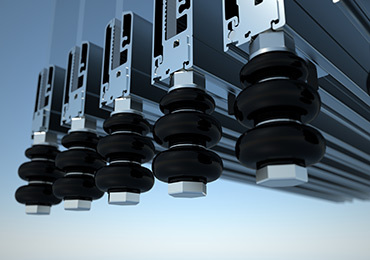 The materials used to manufacture all the component parts of the system have been produced with quality raw materials and are subjected to various tests and controls. 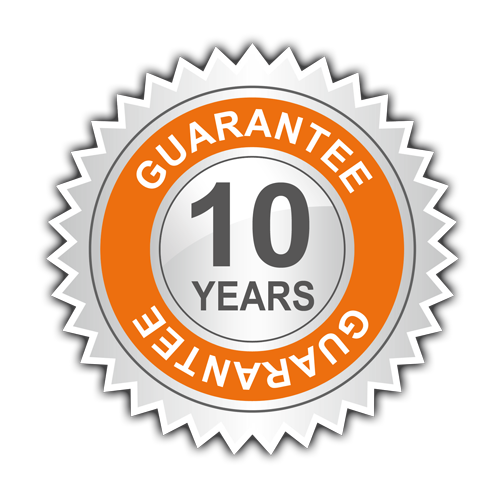 This is why we can confidently offer a 10-year guarantee. Below we have detailed the technical specifications of each of the components of our frameless glazing system. PROFILES:The guiding profiles act as the framework on which the running gears (attached to the glass) slide. 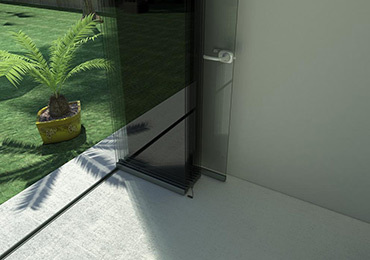 GLASS: We use 8mm or 10mm tempered security glass with polished vertical edges, manufactured to the EN 12150-1 standard. METAL & PLASTIC PARTS: The plastic or metallic parts used in the manufacture of our glass curtains are of excellent quality. The guiding profiles act as the framework on which the running gears (attached to the glass) slide. 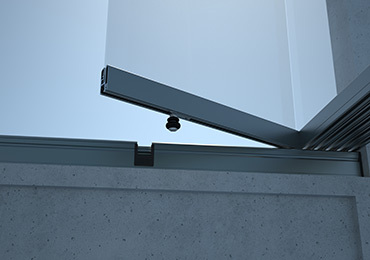 The profiles are manufactured with aluminium (EN AW 6060), with a tolerance that complies with the EN755-9 standard. The profiles remain unaltered over time and do not rust. Due to the geometry and strength of the materials, the profiles can support elements of up to 3 metres in height and 900mm in width. The profile is joined to the glass by gluing and mechanical riveting. The surfaces of the profile can be powder coated or anodised, using any colour from the RAL chart in according to customer requirements. We use 8mm or 10mm tempered security glass with polished vertical edges, manufactured to the EN 12150-1 standard. The rivet holes in the glass panels are made using the established standard distances permitted between the holes and the edge of the glass. Tempered glass can endure much greater impacts than untreated glass. The way that security glass breaks is unique; if a part of the glass panel does get broken, the entire panel will automatically break into tiny pieces, without leaving large pieces or dangerous edges, thereby reducing the chances of injury. The plastic or metallic parts used in the manufacture of our glass curtains are of excellent quality. The metal parts used in the system are all of stainless steel and aluminium, which guarantees their long-term durability. The plastic parts used are composed of weather-resistant materials and are produced using an injection moulding process. The plastic parts of our glass curtains system have passed stringent ageing tests and comply with ISO 4892-2 standards.